← ARE YOU A GOOD ENOUGH PARENT? Are you good enough parent? 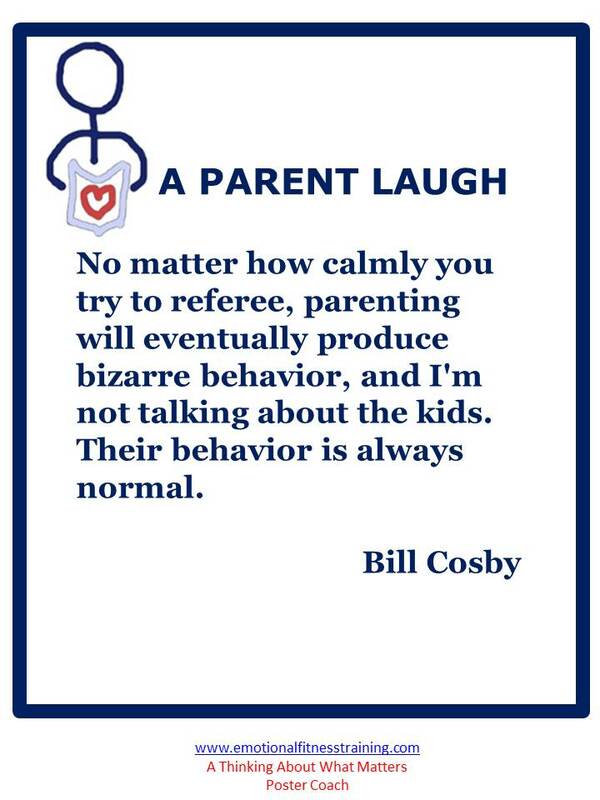 Does this Cosby quote make you laugh? This gave me a chuckle and something to think about. If you had a little laugh then you are a good-enough parent. Tip one: Think of all behavior as being always normal, yours, your child’s, your enemy’s. All behavior is normal when enough is known about the context and the person’s past. Tip two: Normal does not mean acceptable. Understanding does not mean excusing cruel behaviors. Bullies, tyrants, despots need to have cruel behaviors condemned and stopped. Tip three: Reasonable punishments are not abuse when dealing with cruel behaviors. Tip four: Not punishing a child’s cruel behavior is neglect and poses a threat to peace on earth. Tip five: Some people need locking up for the protection of other people. Relationships pose some of life’s more difficult struggles. Keep a sense of humor helps. So does understanding. At the same time, peace on earth can only come about if some behaviors, whether in a child, an adult, or a culture, are stopped. My 76th birthday arrives March 21st. To celebrate my birthday, I am having a party on Facebook and the favors for those attending is an unofficial Emotional Fitness Training® Course. I am also celebrating the launch of my newest book ‘Twelve Easy Emotional Fitness Exercises to Tame Mad, Bad, and Sad Feelings.” If you are a Facebook friend save the date and join me there. For now, go to the Emotional Fitness Facebook Page and give it a Like. How will the party go? Every hour on the hour from 9:00 am USA Mountain Time to 10:00 pm I will post something on my Emotional Fitness Training Facebook Page. What will I post each time? Something related to one of the 12 Daily Emotional Fitness Exercises: a video, an inspiring song or poem, or stories showing how some practice emotional fitness. Throughout the day, I will answer any questions you have about Emotional Fitness Training®. I developed Emotional Fitness Training® during my years as a foster parent and a therapist; however, every age and stage brings with it the need to stay strong. I practice what I preach now more than ever. I tell myself a thousand times a day, stay strong, give lots of love, be grateful, practice kindness, live now, give and seek forgiveness, and always hope the blessing of the forces beyond our control are with you and those you love. Those of you reading this and following me are a big part of what helps me stay emotionally strong. You are all members of what I call my Added Care Team. I am grateful for all you do. Thank you. This entry was posted in Parenting Issues and tagged Cosby Joke, Emotional fitness, Emotional Fitness Training, Good enough parents, help for parents, how to parent, Katherine Gordy Levine, parenting tips, Parents Are People Too, postaday. Bookmark the permalink.